In situations like the one above, the grading of the soil around the house slopes towards the house. As it does, rain will seep into the soil around your home. 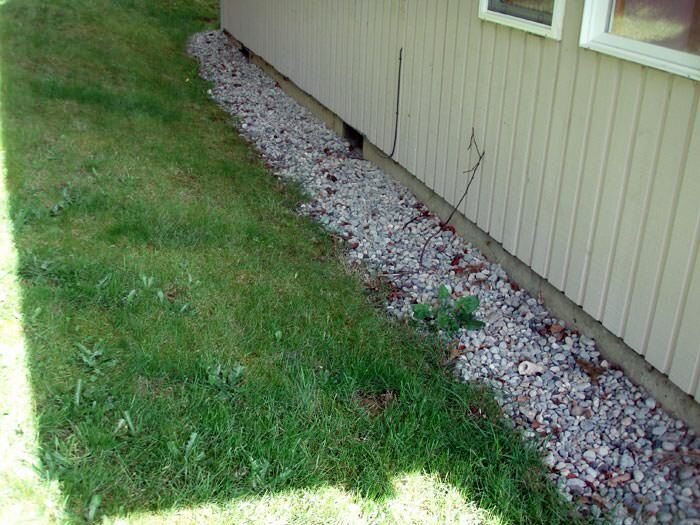 Any gutters and discharge lines around this home are likely to send the water right around the foundation, where it can end up back in the basement. 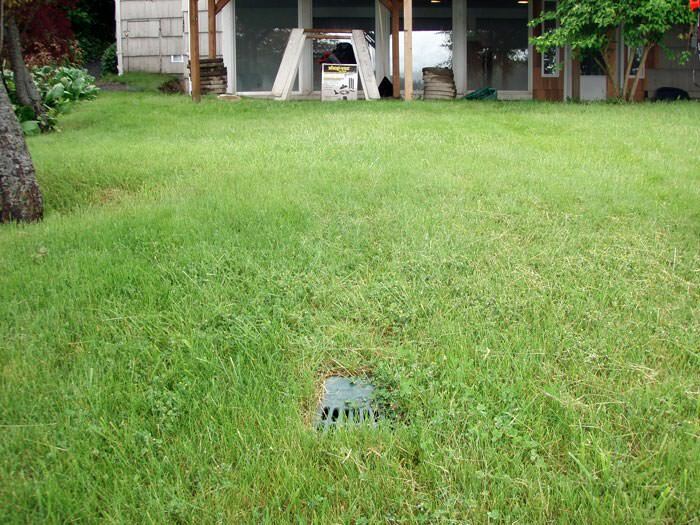 The drainage system around your home is your first line of defense against flooding and water intrusion of many kinds. We are here to protect your home. How you design and maintain that system is key to preventing rot, lawn damage, ice damming, and many related moisture issues. Water seepage can also have a serious affect on your home's foundation. Our specialists can help you design an exterior water management system that will address existing and potential issues. That includes the drains, downspouts, and discharge lines around your home! One of the simplest solutions for keeping your home dry is to prevent water from flooding around (and into) your home in the first place. As the soil around your home becomes saturated with moisture, it can lead to added pressure against your foundation, which has the potential to create or worsen foundation issues. This moisture also has the potential to contribute to any basement flooding and moisture issues. This is particularly true if it's collecting around basement windows or crawl space vents. By "regrading" your yard, you change its slope so that it's pitched away from your home. Of course, it's also vital to maintain your gutters and window wells with regular inspections and cleanings. Otherwise, water can build up on the roof itself, potentially seeping through the shingles and into your home. Rainfall brings an enormous amount of flooding to your home. In fact, a single inch of rain means about 500 gallons of water on an average-sized roof! If your home's downspouts drop this water right at the edge of your home's foundation, then much of that water will enter the soil around your foundation. 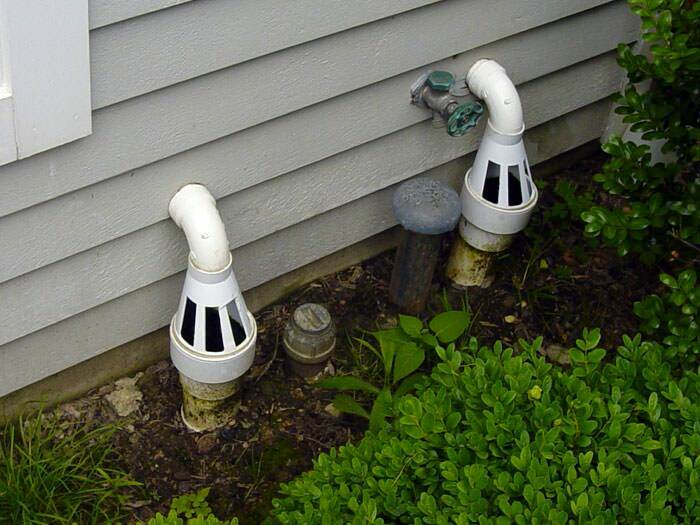 Unfortunately, many contractors and homeowners ignore that fact, and their downspouts are "short" by several feet. Therein lies the problem! In fact, some downspouts are actually designed to maximize the damage done. In the picture on the right, for example, drainage stone has been positioned to trap water and direct it into the soils around this home. 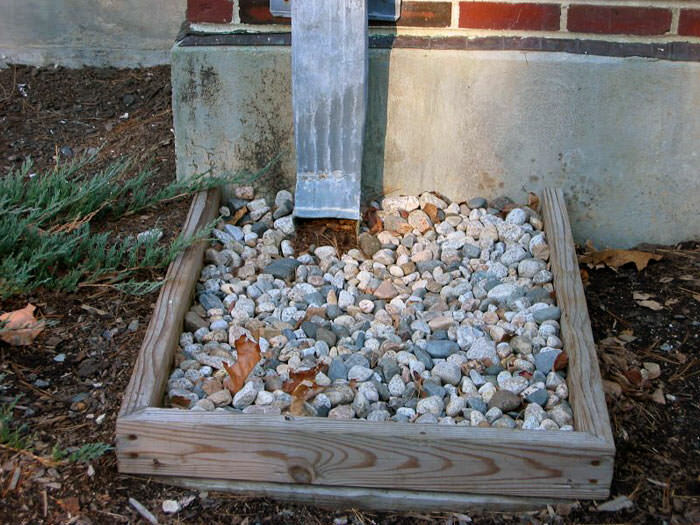 At Frank's Mr. Plumber, we provide homeowners with a selection of downspout extensions that will effectively direct any flooding water away from your home. We accomplish this with our LawnScape™ and LawnScape™ EZ systems. Each of our systems can be installed in the ground to be level with the earth. This eliminates any potential tripping hazard and creates a system that will not disrupt your lawn mower as you maintain your grass. Our gutter extensions are inexpensive and can be installed quickly. And while they are no substitute for a complete basement waterproofing system, they can ease the load on your sump pump by hundreds (or thousands) of gallons each rainfall. This helps you avoid sump pump burnout, and will extend how long your battery backup system can protect your home. Sump pump problems can range from a simple clog in your system to a more serious issue that prevents your system from turning on (or from turning off) at all. Building a few precautions into your sump system will make the difference between one that works properly, and one that fails you when you need it most. A sump pump check valve is a specialized section of your system's discharge line (black, in the photo on the left). This valve is designed to prevent water that has been pumped into your discharge line from washing back into the sump pit. Let's say that your discharge line has 8' of 1 ½" pipe that runs straight up from your sump pump, then bends 90 ° as it extends outward from your home. This much pipe would hold about a half gallon of water in total. If your system had no check valve in place, this water will fall back down each time your sump pump empties the pit. The sump system will be forced to pump out backwashed water again and again, which leads to an earlier burnout for your home's sump pump system. Any water in your sump pump system should be discharged far away from your home, in a location where it can run downhill away from your foundation. Our expert will examine your yard carefully, finding the best location for this line and explaining it to you. In some cases, a creative solution may be applied, such as directing the water to a nearby stream. 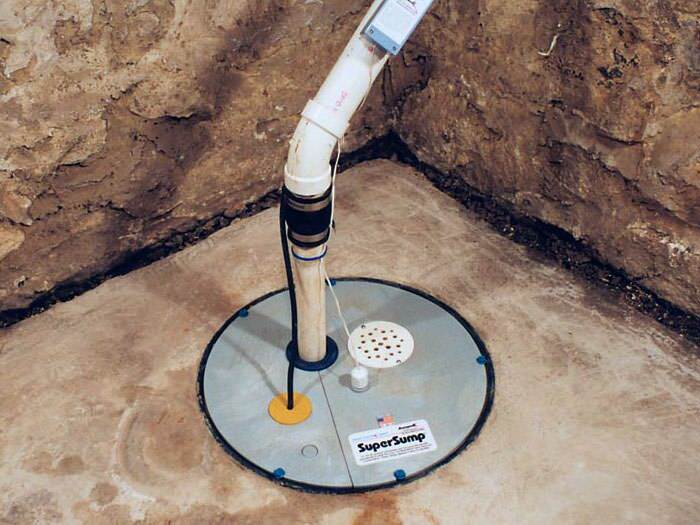 At Frank's Mr. Plumber, a discharge line system is included with each sump pump installation. We bury the lines underground as we install them to avoid the tripping hazard and eyesore that would otherwise be created. Our installation crews take special care to maintain your landscaping as we bury your discharge line, removing sod and returning it as we work. Your discharge line's opening is a notorious weak point in your home's waterproofing system. As the openings become clogged with leaves and other debris, they can slow or completely half your pump's operation. These openings also allow animals into your systems such as squirrels and mice. As they nest in the line or use it to hoard food for the winter, your opening is clogged. Our discharge lines are installed to include grated discharge outlet that helps to keep back debris. For maintenance, the outlet is easily removed for access purposes. Unlike a traditional PVC pipe opening, our outlet cover is a subtle green color. 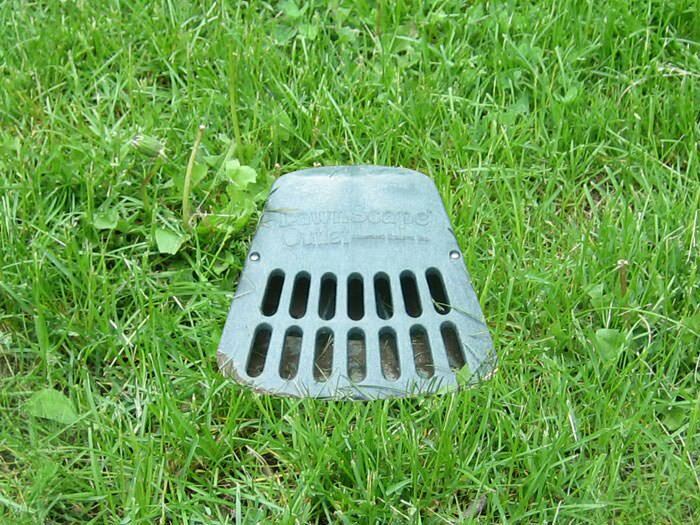 It installs flush with the ground, so you can run right over it with a lawnmower. As cold winter weather settles in, sump pump discharge lines and outlets can often freeze over. As this happens, your drainage system may slow or be stopped completely. With no other way for groundwater to leave your system, it will have no option but to back up and flood into your basement. We address this potential source of failure by installing our IceGuard® Discharge Line Fittings to each of our sump pump discharge lines. These fittings are included automatically as part of our installation and include a grated opening along the top that will give water a secondary way out. 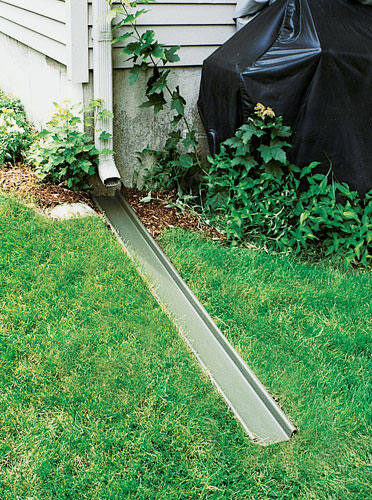 We Have Solutions For Your Exterior Drainage & Discharge Lines! If you live in Greater Buffalo, we're the experts you're looking for! We offer free quotes to all homeowners within our service area -- including an on-site inspection and consultation, and a written cost quote. To schedule a free wet basement repair quote with us at a time that's convenient for you, contact us by phone or e-mail today! At Frank's Mr. Plumber, we proudly serve New York, including Buffalo, Lockport, Tonawanda, Hamburg, North Tonawanda, Niagara Falls, Orchard Park, Amherst, Depew, Grand Island, Lancaster, and nearby.